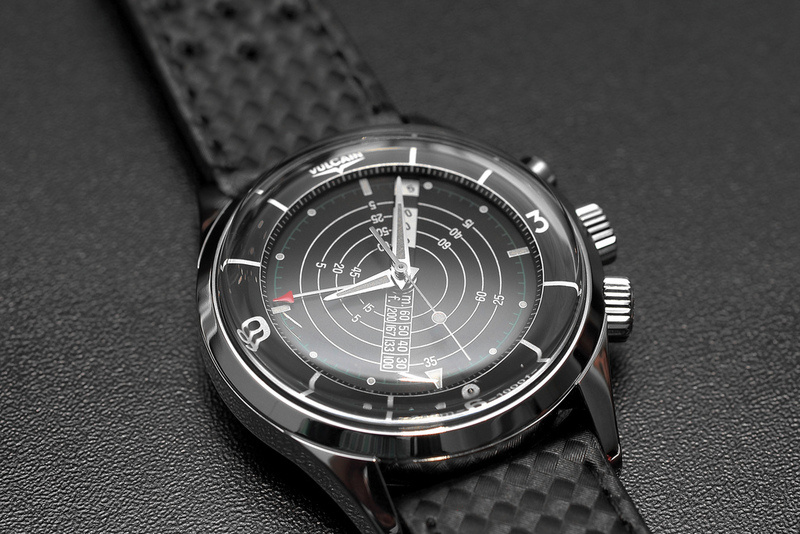 At Baselworld, Vulcain introduced a replica of the 1970 Vulcain Nautical model. The Vulcain Nautical Seventies watch is water-resistant to 300 meters, can indicate successive decompression stops and has an alarm that is audible underwater. 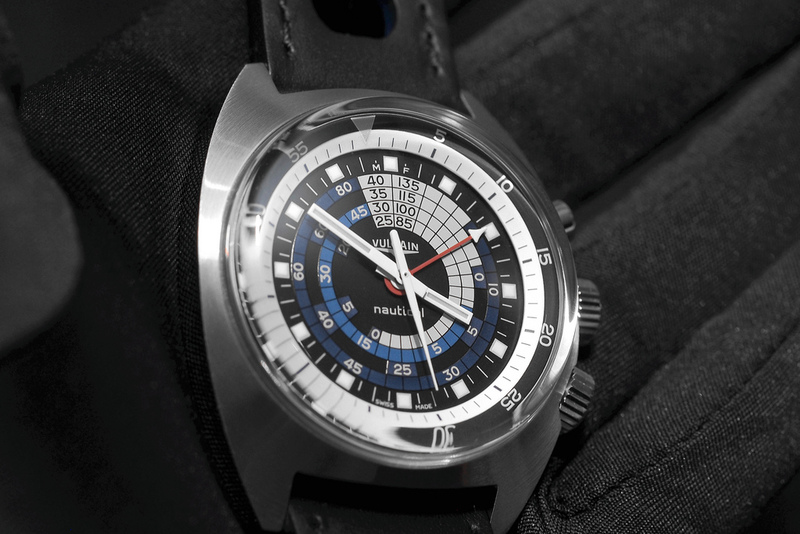 While this Vulcain diver is aesthetically based on the 1970s watch, that timepiece was based on a 1961 Vulcain diver, which was the first wristwatch capable of descending to 300 meters and audibly warning its wearer when to surface, all while indicating the various decompression stops. The Nautical Seventies comes in a 42 mm by 17.60 mm stainless steel case, with alternating polished and satin-brushed surfaces. It has a hesalite square crystal which protrudes well above the case, adding to the vintage feel. A special triple case back construction acts as a resonance chamber and enables underwater use of the alarm function. Inside, is a manually wound alarm movement, with 25 jewels, 157 parts, twin barrels (one for the time and one for the alarm). It is nickel coated and has blued screws, runs at a 18,000 vph (2Hz) and has a 42-hour power reserve. Functions include hours, minutes, centrals seconds, alarm, fixed dial with decompression-table indication and 60-minute graduated rotating inner bezel ring activated by a screw-locked crown at 4 o’clock. The alarm duration is approximately 20-seconds. “When first launched in 1961, the Cricket Nautical was truly avant-garde in all respects. For the first time ever, a wristwatch was capable of descending to 300 metres and audibly warning its wearer that it was time to the surface, while precisely indicating the various decompression stops. At the heart of this model that made an indelible imprint on sports-dedicated horology beat the already legendary Cricket alarm calibre. The Vulcain Cricket Nautical caused an immediate sensation in the field of deep-sea diving. Endowed with technical characteristics meeting diver’s security requirements, this model stemmed from a pooling of various competencies: those of the three experts with whom the Vulcain constructors chose to associate in developing the first diver’s watch equipped with an alarm audible under water. The Nautical Seventies diver comes in two dial variations, blue or orange, on a black water-repellent leather strap, with an orange or blue lining. Available in a limited edition of 300-pieces for $5,950.